The science is clear—controlling insulin is the key to health and metabolic balance, and controlled-carbohydrate diets are the natural way to control insulin. 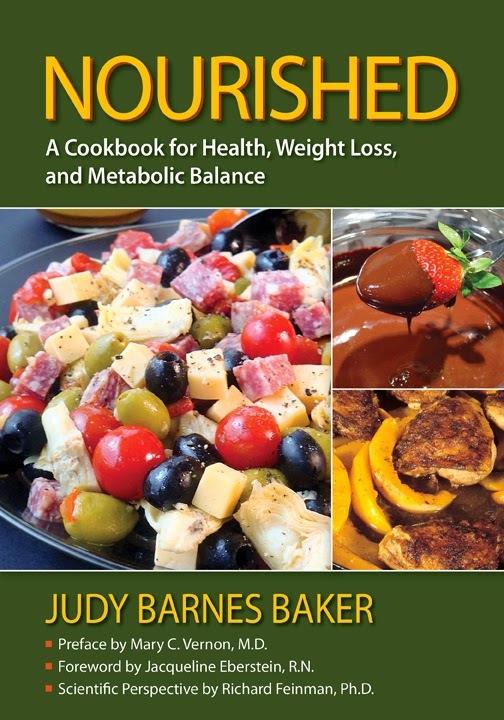 The menus in Nourished will promote effortless weight loss without hunger or deprivation. They can be combined to provide a full day of delicious food that totals between 20 and 50 grams of digestible carbohydrates. Substantial scientific evidence indicates that this range keeps insulin levels low enough to provide a metabolic advantage for weight loss, to prevent and reverse the complications of diabetes and many other disorders, and to reduce or eliminate the need for medications. The 236 recipes in 52 menus contained in Nourished demonstrate just how sumptuous, indulgent, and satisfying this way of eating can be. They range from basic to gourmet; there is a pie with just 3 ingredients, but there is also an authentic gumbo that lives up to the highest standards of New Orleans cuisine. Other recipes include: Vanilla Spice Broiled Chicken, Home Fries, Cheddar Biscuits with Butter and Jam, Candied Fennel Tart, and a Cake with Chocolate Butter Cream Frosting that has less than 4 grams of carbohydrates per slice. There are menus for quick breakfasts and snacks, tasty everyday meals, elegant dinner parties, traditional holiday feasts with all the trimmings, and everything in between. Every menu includes carbohydrate totals for the meal in order to simplify carb counting. Mix and match alternatives and options make them easy to customize for individual needs. A complete nutrition data analysis, including portion sizes and preparation time, is provided with each recipe. Helpful tips, stories, and quotes make Nourished not just a cookbook, but a good read as well. Nourished includes comfort foods and traditional favorites as well as innovative ideas and products. For example: there are recipes for pies and desserts that rival the conventional versions while using non-starchy vegetables in place of high-carb fruits. There are recipes using exciting new products that make it possible to closely duplicate the taste and texture of baked goods made with regular flour and sugar. Nourished is sponsored by the Nutrition and Metabolism Society and endorsed by Innovative Metabolic Solutions, an organization that educates medical practitioners around the world about treating diabetes and other metabolic disorders. “Nourished flows from the science, science that it explains well. Like Judy Barnes Baker’s first book, Carb Wars: Sugar is the New Fat, it provides a good introduction to the metabolic theory that makes dietary carbohydrate restriction the best diet for weight loss, diabetes, metabolic syndrome, and, for most people, general health. Carbohydrate restricted diets are really insulin-control diets, and the science is clear on the need to control insulin fluctuations.”– Richard D. Feinman, Ph.D., Professor of cell biology at SUNY and founder of The Nutrition and Metabolism Society. “…When I recommend this book to my patients, I do it with confidence. Using this excellent tool, they are well on their way to changing their life and health with all the benefits I see every day for this lifestyle: fewer drugs, fewer health problems, more energy, less pain. If they have questions about the science, well, the answer is often here. Judy addresses some of the most common issues and discusses the science. So if I can’t be there to explain, this book can help….I will be using this in my clinic, but I’ll enjoy cooking from it as well. When I bring in these delicious recipes, the hospital staff will gather around pronto. I’m already considering what to prepare for the next holiday when I work. Thanks, Judy. My patients needed this book, and so did I.”– Mary C. Vernon, M.D., Specialist in metabolic disorders and co-founder of Innovative Metabolic Solutions with Gary Taubes and Eric Westman, M.D. 416 pages in full color, more than 80 color pictures. John Phillips Show, KABC Talk Radio. Bookmark.